The first question was: “Dude, are you mad at me?” This question was, in fact, about his guitar sound, because it was probably prompted by the fact that you were not commenting on his sound already. Not commenting would have been better than saying the wrong thing. If you cared about the show starting any time soon that is… Anyway, the right thing to say would have been the answer to the ultimate question, which if Adrian heard without having to ask it back then, would have made his entire year. We’ll get to that in a bit as well. Question number three was: “What album?” No “dudes” in that one. Rather than letting you ruin your musical credibility by bantering on, Adrian has pushed you along closer to the trigger for fusing the constantly raging electricity inside his proto-indie facade, behind his “Adrian” glasses, with the vacuum on stage waiting to be filled with his gravity and defined by some of the catchiest tunes ever put into orbit. There were only about 6 or 7 people who knew what the answer was, and at this point they would intervene, as casually as possible. If you were a Cure fan and you thought you actually knew the answer without really knowing Adrian, you may have said “It sounds just like ‘Show’,” figuring that live album has a lot of tracks from “Disintegration,” and it’s a double disc, so how can you go wrong. Well you can and you just did. As I am approaching, grimacing diplomatically, Adrian is already unplugging everything, just to start over. “That chord from Play for Today sounded just like ‘Paris’.” If I got that in before he pulled the plug, he would ask “What, this, dude?” and he would go into Play for Today as heard on the other live album recorded the same year, 1992, that featured the stadium Cure mimicking the sound of the early goth Cure and hitting perfection. Adrian was never satisfied with his sound, it was never quite like “Paris.” The game was rigged. Technically, beginning with 1981′s “Faith” album, Robert Smith began using a six string bass, the Fender VI, extensively, besides his legendary Fender Jazz Master and Gretsch Chet Atkins. This especially became the case with their live shows when Porl Thompson came back to The Cure (he had been in the original Easy Cure as a teenager), because Robart Smith had another guitar filling out the sound when he needed it. 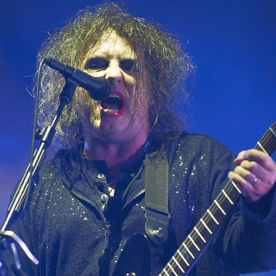 Robert Smith sort of turned into a six string bass B. B. King, simply adding atmospheres and two-string leads between lines of singing. He does seem to use the Schecter Ultra six string bass in 1992′s “Paris” live album version of Play for Today, and by then The Cure’s concert footage features the guitar quite a bit . I used to think that Robert Smith played bass only on rare occasions like on the song Faith, but the Fender VI and the Schecter Ultra six string basses were his guitars of choice even on widely known cuts like Just Like Heaven, Pictures of You and many more. Later on, Robert Smith got a promotional deal with Schecter Guitar Research, who made a custom version of their Schecter Ultra six-string bass just for him and called it the UltraCure. The gouge of the high strings on a six string bass is just thick enough to make the ch0rus and flanger sound fuller. Adrian must have known this. There are ways one can come close, of course, with Boss pedals, the effects that used to be associated with garage bands everywhere. In the studio, apparently Robert Smith used the built in chorus of a Roland Jazz Chorus amp and the phaser of a Peavy Mark III bass head. Once he played with Siouxie and the Banshees in 1982, around the “Hyaena” album days, he started using a Boss Flanger 2. Sometime 20 years ago, however, by his own admission, I’ve heard, he fell in love with all the Boss pedal colors and started using more of them. via The Cure’s Robert Smith – Secrets of his guitar sound.